Session Detection is the final step in the configuration of the Login Sequence Recorder (LSR). A valid Session Pattern is vital for a successful scan, as with it the scanner is able to identify whether it is authenticated or not. During a scan, the session detection request is sent continuously. When successful, the scanner will progress; if unsuccessful, the scanner will replay the recorded steps in the LSR, authenticate itself, and keep running the scan from where it left off. It is therefore vital that session detection is configured correctly. What shall I do if the LSR failed to identify a session pattern? 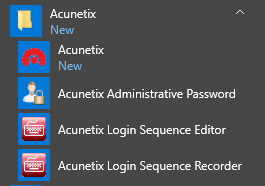 Acunetix will try to use the requests sent during the login stage to determine a valid session detection request. Sometimes, the requests sent to login are not enough to detect the session detection request automatically. In these cases the LSR will prompt you if a session pattern is not found. Should a valid pattern not be found, select the option to Detect while navigating. With this option selected, navigate to pages/paths which are accessible only through an authenticated session, for example a user profile page. Keep navigating to similar pages until a valid session pattern is identified. You can verify the session pattern by clicking Check Pattern at the top of the right-hand-side panel. Invalid Session Patterns occur when the LSR cannot identify a difference between the responses received for a chosen session detection request. For example a request to http://testphp.vulnweb.com/index.php will always return a status code of 200 and contain the same response body, irrespective of whether it is authenticated or not. This would make this pattern invalid. Session IDs or tokens normally expire after a period of time. Since the LSR is played back after a period of time during a scan, this session pattern would most likely have expired. In this case the application will respond with the same response, both when logged in and not. This will result in a status code of 404 Not Found as this URL no longer exists. Playback the Actions required to Login and navigate to the Session Detection pane. You can verify the session pattern again by clicking “Check Pattern” at the top of the right-hand-side panel. If there were any token/session based issues, a new token/session would be generated when playing back the login actions and the pattern checking would fail.